The open-source HEAT-1X Tycho Brahe rocket, built by the non-profit Copenhagen Suborbitals, has semi-successfully launched. Why "semi-successfully"? It got off the launchpad, but it achieved an altitude of 2 only kilometers--well short of its 16-kilometer goal. The rocket took off as the group of Danish Space enthusiasts had hoped, but then it began to veer off to one side. Kristian von Bengtson of Copenhagen Suborbitals cut the engines remotely to prevent the rocket from leaving the launch area. Unfortunately the rocket’s parachutes also did not deploy properly and it made a crash landing on the ocean. The HEAT-1X Tycho Brahe is suborbital space travel vehicle intended for one man, who rides at the very tip of the fuselage. However, the rocket you see is currently occupied by a 155-pound dummy. The manned-flight design will be super-sized for greater altitudes than the test range. 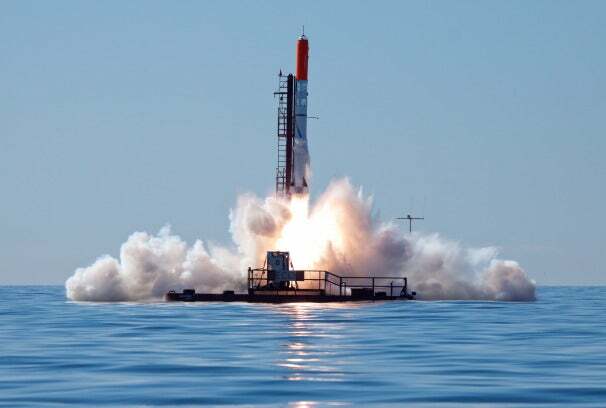 The rocket has been in development since 2008, and it finally took to the air from its home-built Sputnik Mobile Launch Platform (a sheet metal and steel catamaran) on June 3. Despite the short flight, Copenhagen Suborbitals were happy about the result.